From the pages of the red-hot Vertigo series comes a five-issue spinoff miniseries! 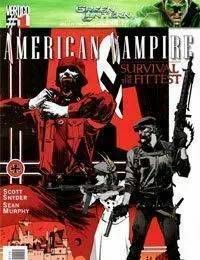 Its World War II in Nazi-occupied Romania as vampire hunters Felicia Book and Cash McCogan (last seen in the critically acclaimed AMERICAN VAMPIRE story Devil in the Sand) go behind enemy lines with the secret organization known as the Vassals of the Morningstar in search of a rumored vampire cure. But their haunted, twisted past with Skinner Sweet makes the mission more difficult than they imagined. Superstar artist Sean Murphy (JOE THE BARBARIAN) joins Scott Snyder to tell a story of horror and history, expanding the American Vampire mythology in a way that changes this story forever.